Mosquito Nets There are 4 products. The mosquito net is an effective protection against mosquitoes from entering through open doors and windows during hot summer days. Taking care to place these mosquito nets, we can sleep peacefully at night heat leaving the windows open for some air run but, at the same time preventing paso mosquitoes. In addition to this more urban, the mosquito nets are widely used in rural areas to protect crops or fruit trees against insects of all kinds and even as protecting them against some weather. How to place a mesh mosquito net? 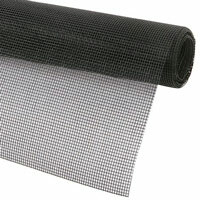 Meshes for moquitos usually made from either polypropylene or fiberglass coated PVC, which makes it very resilient. They should be treated with anti-UV additives do not end up deteriorating with sunlight. 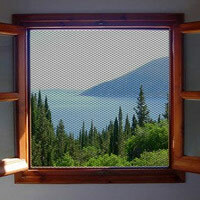 They are very easy to install, simply affixing mesh with a wooden frame measures hollow window or door, then stapling the mesh on it and finally cutting the excess tissue. In Bricolemar you can find tights nets in green or gray, in different sizes and 'mesh' (size of the holes left free) and always with the best prices in the market.